Attacking the person during a conflict. We are going to disagree with our spouse. It is inevitable. Yet how you approach conflict matters. Is it you and your spouse against the problem? Or is it you against your spouse. If it is you against your spouse, then this is a dangerous place to be. Nothing tears away at connection like attacks. Focusing too much on the kids. This is so easy to do. Let’s face it…every stage of parenting is demanding. We love our kids and there are things that have to be done. Yet, neglecting the marriage relationship actually is harmful to your kids. Not taking time for each other. This is similar to busyness but it is worth noting separately. 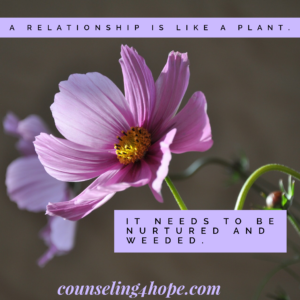 Not taking time to connect emotionally, mentally, relationally, and sexually on a regular basis will damage the core relationship. How can you have a thriving relationship where there is no connection? Assume your spouse is a person of good will. I know…I used the word assume. THIS IS THE ONLY ASSUMPTION THAT IS OKAY! You married this person and they may be different than you but ultimately they love you so give them the benefit of the doubt. Assume they are for you. The only exception to this would be if they are abusive. Please reach out and get help if you are being abused. Click here for resources. Bring everything into the relationship. If you feel slighted or hurt. Talk about it. Share your fears and concerns. Let your partner tell you what they are thinking and feeling so you don’t have to guess or assume. Let them comfort you and be your safe place. When your partner brings something to you that you’ve done to hurt them, own it…even if it was unintentional. Use I statements. When sharing with your partner only start you sentences with I. I feel…….I think…..When that happened, I……. Please don’t start sentences with you. That assumes motives, puts others on the defensive, and is an attacking stance. Listen. I know what you’re thinking. You know how to listen. Do you really? Most of us spend the time we should be listening thinking of what we are going to say next. Listen. Summarize what they’ve said and ask if you heard it right. Listen for the emotions they are feeling and share that with them. Study your partner. What do they like to do? What is their personality type and how is it different from yours? How do they experience love? What energizes them and what drains them? What are their hopes and dreams? What are their fears? How are they different because they are a male and you’re a female (or vice versa)? Make it your goal to know them well and appreciate the uniqueness that is your spouse. Spend time together. Relationships only grow in closeness when you are together. Do you talk each day about life? Do you have regular date nights? Do you put the kids to bed early so you can spend one on one time with each other? Now it would be great if both partners read this and applied these principles. I hope you’re married to someone open to that. You may not be. There is great power in one person changing. It really can change the whole relationship. If you struggle with any of these things, I would recommend seeing a counselor who works with couples. Most people wait too long before they see a counselor. There is so much hope.